I purchased my DP300F about 3 years ago and I've been enjoying it ever since. It's my pride and joy. I probably average around 5 to 7 hours of use per week and it's never let me down. I did swap out the stock Denon cartridge for a more expensive Audio Technica AT120E and noticed an improvement in channel separation and dynamics, but even the stock cartridge was pretty good anyway, and I still have it as a backup. It does have a plastic plinth (maybe this accounts for the lower price), but it's a very thick and sturdy plastic plinth. It looks great too. The tonearm has a removable headshell and vertical tracking force adjustment. Just in case you want to try different cartridges. I put a rev counter on the platter a while back, and it clocked in at a steady 33.6 revs and 45.3 revs, which is pretty good for a belt drive table. It does have speed adjustments that are accessible from under the plinth. All in all my DP300F is a great turntable for the money. 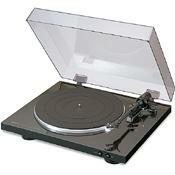 It's a midrange table along the likes of the AT LP120 or Rega RP1. I give it 4 out of 5 stars, but only because there are higher end tables out there, but you'll have to pay a higher end price. After initial enthusiasm about the great sound with standard needle element, three months later I'm deeply disappointed about this player from Denon. Unfortunately, after the deadline had expired to return it, the motor of the player started to fluctuate in speed with horrible sounding records as a result. Denon has clearly chosen to make their players in China, but also are now using inferior parts. A little further reading on the internet made clear to me that a lot more users complain about this problem. It's a disgrace that Denon continues to sell this player. For me, never a device from Denon. This little turntable is capable of delivering top-notch performance while being, well, cheap. It looks great and is easy to set up and to anyone familiar with turntables is intuitive to use. The tonearm is well designed and can carry my cartridge to .75 Grams without a hitch. Included cartridge is only fair. You will want to replace it for best playback. It does get you started, however. One of the great bargains in turntables today. Pros: Sounds great, easy-to-use, auto-return, built-in pre-amp (if needed). Summary: I own 2 units, so I really like these turntables. Originally, I was buying the DP-300F and a Rega P1, however, after I got the first one I realized what a beautiful, well built turntable. The arm really is the quality you expect on a manual unit, except that it has automatic place and return. I own two very good cartridges from Audio Technica: 1) AT440MLa (micro line), 2) AT311EP (with shibata stylus). The micro line tracks perfectly and really is reserved for my most expensive classical and jazz, and the shibata plays rock music with the best of them, loud and detailed. Did I say how beautiful this design is with a finish comparable to high gloss lacquer. I don't like to compare, but you would have to go big money (with Thorens) to match the quality of this automatic. Unlike Thorens, you can use any Audio Technica (including the moving coil) without having to worry about the cartridge fit. I have had this unit for 6 months and love it. Othe runits you tend to see it compared to are the regas p-1.music hall 2.1And the pro-ject all entry level. The dp 300-f weakness seems to be the lack of arm tweeking ability. The strengths are the fully automatic features auto position ,auto return and built in phono equalizer. The auto return gives you mor life out of your needle. the phono EQ saves you money if you do not have that setting on your tuner or pre-amp.This is a great tt and I have no regrets.